RXAir - RXAIR1-A : Air Purifier Review • The Air Geeks, reviews of air conditioners, dehumidifiers and air purifiers. Have you been struggling to eliminate airborne pollutants from your room? The RXAIR1-A is a strong air cleaner that eliminates various airborne pollutants to ensure that the air in your room is clean and fresh. This air purifier is one of the few that are suitable for very large rooms (think: 800-1000 sq ft) and can be used in offices, homes, hospitals, schools, et cetera. In case you are planning to buy this unit for your home, school, or office, we are sure that you are interested in knowing its features, strengths, and even weaknesses. We have thoroughly researched to provide you with reliable and unbiased information. This information will certainly help you to make a well informed decision. Without wasting time, let us start with its description. 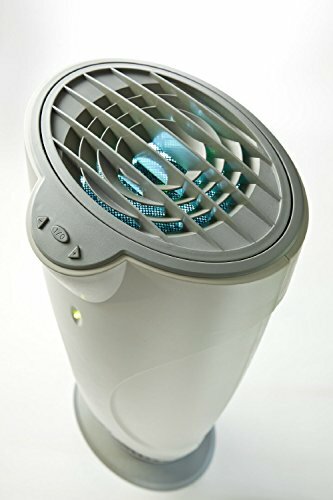 The RXAIR1-A air purifier has a good reputation of eliminating bacteria, viruses, germs, and other harmful microorganisms. This air cleaner is based on the highly effective Viratech air purification technology. This mechanism utilizes high-intensity ultra-violet light (UV-C) to destroy over 99% of airborne viruses and bacteria. The RXAIR1-A is popularly used in schools, day-centers, and hospitals to eliminate various disease causing microorganisms including H1N1, Flu, Pneumonia, SARS, Strep, MRSA, Measles, TB, and common cold. In case you are looking for an air cleaner that is suitable for reducing odors, then the RXAIR1-A is a good option for your air purification needs. This air cleaner eliminates odors and chemical smells to give your room a fresh air smell. It is therefore a good choice for use in schools, nurseries, work environments, and homes. If you have been struggling to reduce odors, then this air purifier will help you to create a fresh air environment in your home, school, and so on. It is not uncommon for household appliances to produce disturbing noises. This air purifier uses minimum moving parts and therefore does not produce irritating sounds. This makes it a suitable choice for use in quiet places such as hospitals, schools, and bedrooms. Nevertheless, we have observed that it produces a loud sound when it is in the highest speed setting. The RXAIR1-A circulates air up to six times per hour to ensure that all corners of your room have clean and fresh air. In addition, it is suitable for spaces that are as large as 800 square feet. This unit is filterless and therefore no filter replacements are required. Are you looking for a multipurpose air purifier that can eliminate disease causing microorganisms as well as capture airborne particles such as dust and pollen? If your answer is yes, then the RXAIR1-A may not be the right unit for you because it lacks filters to capture particulate matter. From our research, we have noted that majority of users who had purchased this unit hoping that it would help to reduce dust, pollen, and other particulate matter were not satisfied with its performance. On the other hand, it germicidal features makes it a suitable choice for users who want to eliminate disease-causing microorganisms. Maker-recommended Room Size 800 Sq. ft. Highly effective in destroying disease causing microorganisms. 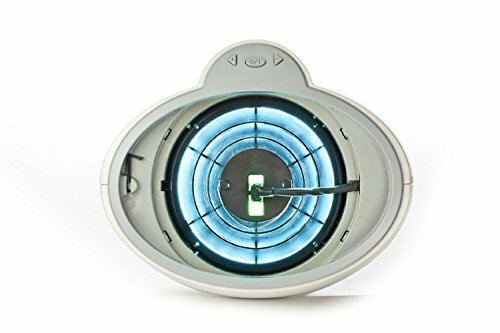 This air cleaner effectively destroys bacteria, viruses, and other pathogens to ensure that your family is safe and protected from most airborne diseases. No maintenance required. Unlike most air purifiers in the market, this unit is filterless and the user therefore does not need to think about replacing and cleaning filters. Strong and blows a lot of air. We have noted that this unit moves a lot of air especially in highest setting. Unfortunately, under this setting, the unit produces a relatively loud sound. Does not capture particulate matter. This unit uses the high-intensity germicidal ultraviolet light to sterilize various disease causing microorganisms but lacks a filter to capture particulate matter such as dust particles. Relatively loud fan. From our research, we observed that this unit produces a loud sound when it is in the highest speed setting. In this setting, the RXAIR1-A cannot be placed in a quiet place because it is likely to cause disturbances. I have owned this air purifier for over a year. It's so nice to turn it on high when I'm dusting or brushing our dogs etc. you can literally see the dust and pet dander clearing the room in a matter of minutes! I also had a great experience with customer service. Honestly other companies could learn from these guys. They were amazing. They took care of my problem immediately. They went above and beyond what I could ever ask for. And the best thing is they did it without me having to ask. Now that's great service. They actually care about their customers and their products. Highly recommend this product." I have used this in my bedroom for three years. We have not gotten any colds and we sleep much better.It has over 15 fan settings. We keep it on a low setting at night and it is very quiet. My wife smokes sometime, but it eliminates the smell." If you are looking for a unit that will protect your family from colds, flu, and other diseases that are transmitted through air, then you should consider the RXAIR1-A. This air purifier is also a good option if you are looking for a unit that you can use in your school, hospital, or office. Although this unit performs impressively as far as destroying disease-causing microorganisms is concerned, we noted that it is not a suitable choice for capturing dust and other airborne particles since it does not have a filter. In case this drawback is not a big issue to you, then the RXAIR1-A could be a good choice for your air purification needs. This air purifier “only” costs $ 380, and works very well. Recommended.